Our 12 yr old Golden Lab mix. Getting older and slower and still man's best friend. Aaah cute. We had a lab called Sam who was part of our lives for over 14 years and is still sorely missed. As Caroline said very cute, we too had one called Tuppence many years ago, odd name but she followed a retriever called Penny. My heart melted! What a face. Our lab mix turns 11 this year. It's hard seeing her get gray hairs and slow down. She's been the glue that has kept me together more than once and thinking of not having her some day is hard and I try not to stay on that thought long because it's not a day I want to face. Lots of play, squeaky toys, quality food and affection and hopefully she'll keep me company for years to come...Tucker for you too. 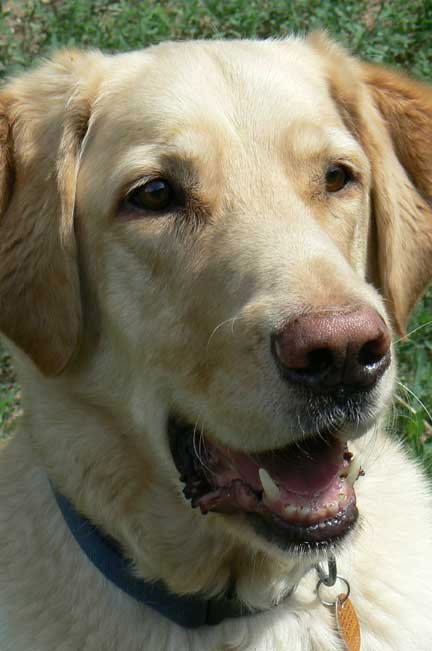 Sadly, we lost Tucker to old age on the Thursday before Valentine's Day 2011. Ski Area is FINALLY OPEN!!! !